San Antonio Scorpions fans cheer on their team during a Lamar Hunt U.S. Open Cup match last year. Local politicians hope to bring a MLS team to Toyota Field in the coming years after agreeing to a deal to purchase the stadium from Scorpions owner Gordon Hartman on Wednesday. 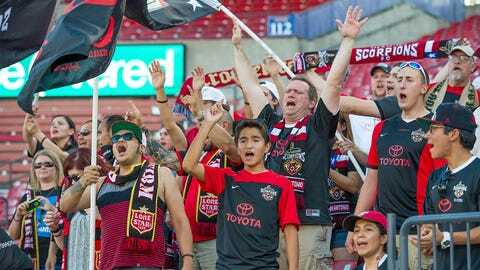 City and county officials in San Antonio have agreed to purchase Toyota Field from San Antonio Scorpions owner Gordon Hartman with one eye on bringing Major League Soccer to the city. San Antonio mayor Ivy Taylor and Bexar County Judge Nelson Wolff confirmed the pending deal at a press conference on Wednesday. City and county officials are expected to pay $18 million for the 8,500-seat stadium, pending the approval of the Bexar County Commissioners Court and San Antonio City Council. If the city and the county receive the necessary approval to complete the deal in the next few weeks, then they plan to acquire the stadium and sign a 20-year lease deal with Spurs Sports and Entertainment to operate the facility and lay the groundwork for an expansion bid, according to the San Antonio Express-News. Spurs Sports and Entertainment — the parent company of the NBA’s San Antonio Spurs — has agreed to pay Hartman a further $3 million if the city and the county are able to complete their purchase. As part of the deal, Spurs Sports and Entertainment has promised to pay a $5 million fee to San Antonio and Bexar County if the group is unable to procure a MLS expansion club during that time period. The sale of Toyota Field marks the latest step in San Antonio’s protracted quest to tempt MLS to the city. Hartman expressed interest in bringing the Scorpions to MLS in recent years, but he also underscored the need for further investment to provide the necessary capital. It is unknown at this point where Hartman and the Scorpions fit into the picture. Hartman closed the Scorpions’ Development Academy program earlier this year and fired coach Alen Marcina at the end of the NASL season. Hartman previous expressed a desire to partner with an outside investor to pursue a MLS team, but Spurs officials could choose to start their own club instead of taking control over the Scorpions, possibly in USL. In order to mount a viable bid for expansion, any prospective investor/operator must fund extensive renovations at Toyota Field. The current capacity is not suitable for MLS, but Hartman and Scorpions officials outlined a three-phase plan to increase the capacity to 18,500 in September 2014. Hartman pegged the potential cost of those renovations between $38 million and $45 million, according to the Express-News. MLS commissioner Don Garber outlined plans last year to expand the league to 24 teams by the end of the decade. Recent movement — including the arrival of New York City FC and Orlando City and the contraction of Chivas USA — left the league at 20 teams this year. Atlanta United FC is scheduled to enter the league in 2017, while Los Angeles FC (2018) and Minnesota United (2017 or 2018) are slated to join them in due course. Miami is expected to round of that expansion round with a David Beckham-led project, but Beckham and his investors have yet to seal the stadium deal required to guarantee their place in the league. San Antonio joins Sacramento at the top of the list for further expansion down the line. Sacramento Republic officials maintained their quest to secure a bid by releasing a team-commissioned study on Wednesday touting Sacramento as a comparable partner to cities like Kansas City, Orlando, Portland, Salt Lake City. City and team officials have also outlined plans for a downtown stadium, pending the award of an expansion team. Austin, Indianapolis, Las Vegas and St. Louis have also indicated potential interest in bringing MLS to their cities. MLS issued a statement on Wednesday noting the news out of San Antonio and underscoring its desire to learn more about the project in the months ahead.